An external hard drive is a data storage device that can store digital data and can be attached to your computer through a USB port. This article will provide you with instructions on how to connect and map your external hard drive to your network for easy access. NOTE: In this article, Windows® 7 is used. Connect the external hard drive to the USB port of your server or computer that is always ON. IMPORTANT: Take note of your server or computer’s IP Address as it will be used to map the shared hard drive on your network. Click the Start button, then click Computer. The external hard drive should be displayed. 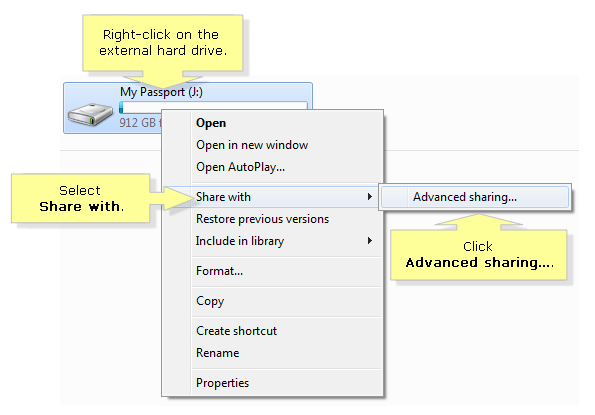 Right-click on the external drive, then select Share with. Click Advanced sharing…. Click the Advanced Sharing… button. Check the Share this folder option. Click Add and then enter a name for the folder or drive you want to share. NOTE: In this example, Shared_Storage is entered as the name of the external hard drive. Select the Everyone option. This drive will be accessible to everyone connected to your network. 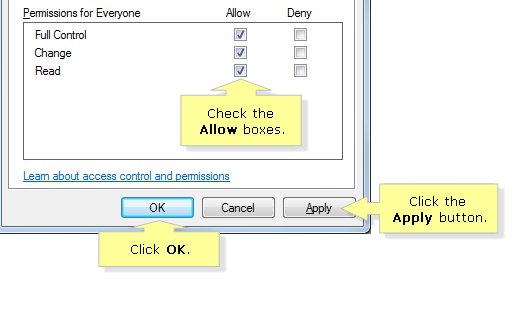 Check the Allow boxes next to Full Control, Change or Read option. Click the Apply button and then click OK to close the User Settings window. Click OK to close the Permission window. Click Close to exit the Advanced Sharing window. The external drive is now connected and shared over the network. In another computer that is connected to your network, click Computer and then click Map network drive. In the Map Network Drive pop-up window, enter “\\server_address\sharename” on the Folder field, check the Reconnect at logon checkbox and click Finish. 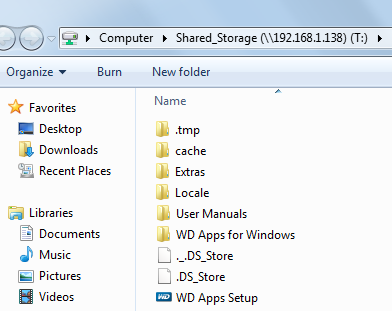 NOTE: In this example, \\192.168.1.138\Shared_Storage was used. This is the IP Address of the shared external hard drive. The contents of the mapped network drive should display. Your mapped network drive shortcut should now be accessible in the Computer window.